After 30 years of continued innovation, we're proud to be able to continue to support Knowledge Bowl with our newest model, the 100C Knowledge Bowl Timer. 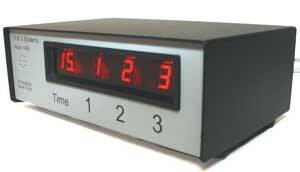 The Model 100C Knowledge Bowl Timer features a lighter, more streamlined, bar design, and a more compact case. You can still expect the same rugged materials built to stand up to day to day use. V&V Systems sells directly to schools, booster clubs, and individuals. While V&V Systems products are designed for durability and long life, occasionally repairs may be required. Should your unit need servicing, we're here to assist you. The 100C is used in Knowledge Bowl competition to determine which team responded first second and third and then to measure the time for a team to provide their answer. Bars - The bars are now equipped with a modular connector compatible with telephone or Ethernet cables. Five second countdown - Assisting the moderator to time the interval from the end of asking the question and waiting for a team to respond, the five second countdown timer will beep if no team has responded in the allowed time. Single button moderator control - The moderator can now control the 100C with a new streamlined single button control. A single click will start the five second countdown (above) before a team has responded or reset the clock once a question is active. A click and hold will reset all in preparation for the next question. The 100C consists of one timer and three touch bars along with required cables and power supply. Note: Sales tax is applicable for all orders shipped to addresses in Washington state and will be computed at time of order shipment based on the specific delivery address. Replacement bars are available. Please contact Sales for more information. You may also contact info@VandV-Systems.com for orders and status. Write a brief description of the problem and include any details that will allow duplication of the problem and any special instructions. Enclose a purchase order for the repair (except for warranty repairs).